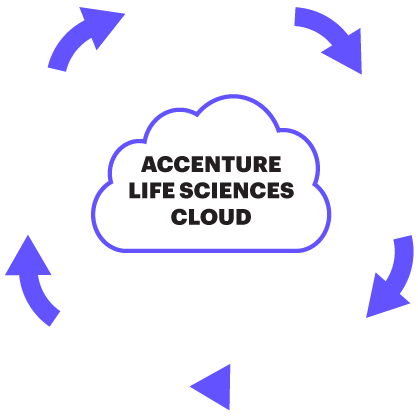 Accenture Life Sciences Cloud for R&D (ALSC) helps companies run faster clinical trials with better transparency and easy access to trial information so you can make smarter strategic decisions. through a collaboration with our Life Sciences Cloud Coalition comprised of global industry leaders working together to transform R&D and deliver better outcomes. Check out how Pfizer, Merck, Vertex, and GSK are revolutionizing R&D. Our Life Sciences Cloud Coalition brings together like-minded leaders to drive innovation and digitally-enable R&D to speed drug development and improve quality—sharing experience, contribution and risk. Listen to R&D leaders talk about transforming the industry. to capture, store, import and standardize diverse and complex internal and external data types that continue to grow in volume. With this capability, our clients are able to compare and contrast data that was previously never comparable and unlock information about their products and operations never known before. The Clinical & Scientific Data Warehouse (CSDW) delivers a platform to aggregate data for analysis. CSDW provides the business an aggregated view of both internal and external data, conformed to industry standards, in a fully validated, high-performance environment. Enforces and tracks standards across data from multiple systems and enables data standardization for cross-study analysis. The Analysis & Reporting Workbench (ARW) provides a flexible statistical analysis environment that audits traceability between data, programs, and outputs. ARW is the powerful tool for planning and developing outputs within a controlled validation cycle. It defines the analysis components that can be tracked and re-used across multiple studies and programs, enabling validated programs and report structure well before database lock. The Metadata Registry (MDR) enables industry standards management and creation of study specifications based on approved standards. MDR provides Clinical Data Standards Metadata to ensure submission of CDISC-compliant clinical data to Health Authorities. It includes structure and attributes to extend standards for Study Usage for ADaM, Controlled Terminology, Data Acquisition, Data Review Model, Data Verification, SDTM, TFL, Transformation/Mapping, VLM standards. The Unstructured Content Repository (UCR) provides a central storage location creating a single source of truth for all ALSC content. UCR is the cloud storage location of all ALSC content with full indexing providing robust content search capabilities. It allows business users to quickly and efficiently store, retrieve, and re-use content across the platform for a myriad of clinical processes and operations. COIP is the trifecta of operational data-warehousing, analytics and machine learning engines in one. It helps reduce “Time to Decision” and gain deeper insights on Trial Operations data enabling operations teams to run in an agile manner to proactively act on potential risks as well as effectively manage day to day Clinical Trial operations. Confidence in data and information with a single source of truth. Ability to seamlessly track and manage thousands of studies with the push of a button. Enablement of a new partner operating model and an engine for sustainable innovation. Simplified access to patient data and study information. Streamlined processes and documentation that reduce workarounds and inefficiencies. Accelerated cycle times in study start-up and backend data management processes. Enhanced quality built into architecture, study design, standards, processes and documentation. Seamless integration with data standards management processes. Improved collaboration on patient and study information. Enhanced processes increasing business efficiency. Robust quality measures ensuring regulatory compliance and inspection readiness. Jonathan Burr is a managing director of Client Services within Accenture’s Life Sciences R&D Practice. With over 15 years of experience in the Life Science industry, he leads sales, marketing and the product strategy for the Accenture Life Sciences Cloud platform. Michel is a managing director of product strategy for the Accenture Life Sciences Cloud platform, responsible for driving the product vision and roadmap. With a diverse range of experience, Michel has delivered a number of roles across the Life Sciences R&D value chain both prior to and during her time with Accenture. She has experience as a scientist, business analyst and project manager.